The partnership entails different aspects in helping to empower children across the globe through education and mobile fundraising. UNICEF has chosen CM.com for new mobile fundraising activities in South Africa. For World Children’s Day on 20 November 2017, UNICEF is set to launch a video in which UNICEF asks the public to celebrate the right to be a child. Texting the word UNICEF to 45642 triggers a reply SMS through which people are able to donate to the organisation. It is the first time that UNICEF embeds mobile fundraising in South Africa. The video is being launched and featured in Ster-Kinekor cinema halls across South Africa. Furthermore, Mango Airlines and South African Airways are featuring the video in their in-flight entertainment systems to raise awareness for World Children’s Day. The strategic partnership has officially been signed in The Hague, Netherlands and will continue for three years. CM.com will be joining UNICEF’s Techno Girl Programme, which is an innovative job shadowing programme that aims to strengthen girls’ entry and learning in technical fields the economy requires: science, technology, engineering and Mathematics (steM). Supported by UniCef, the Uweso trust and the Government of south Africa, Techno Girl works through a public-private partnership model and seeks to reduce the skills shortage while contributing to the promotion of gender equality in these male-dominated fields. Two girls will be provided an internship at CM’s headquarters in Breda, Netherlands, for a duration of three months in 2018. In return, UNICEF will actively promote CM’s mobile services across South Africa, such as the McMoney app. With the McMoney app, people can earn money by receiving test text messages in order to verify the quality of global messaging routes. The money earned with the app can in turn be donated to UNICEF as contribution towards protecting and defending children’s rights. 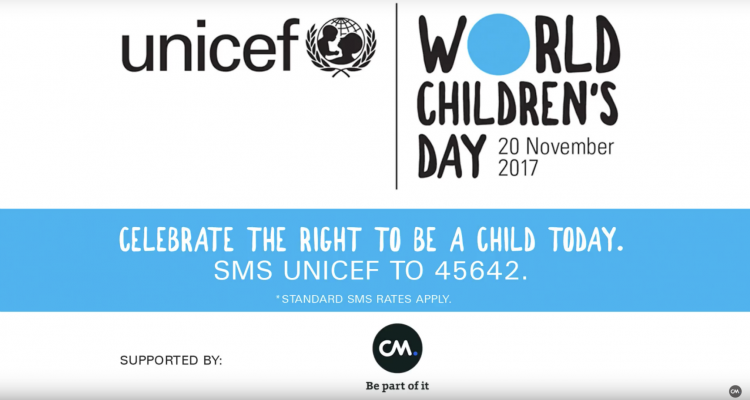 James Bayhack, Country Manager for CM.com in South Africa, said: “CM is proud to partner with Unicef, utilising our mobile services to best support their fund-raising efforts for World Children’s Day. This is just the beginning of our strategic partnership and we will continue to strive and move forward to make a difference”.